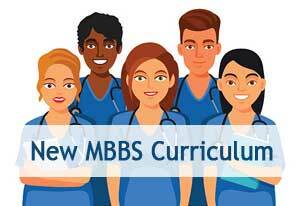 New Delhi: The Medical Council of India (MCI) has released the Competency Based Undergraduate Curriculum. The Board of Governors (BOG), which approved the changes in the revised ‘Competency-based UG Curriculum’ post which a document to the effect has been released by the council on its official Website. MCI has clarified that the Competency Based Undergraduate Curriculum will be implemented from August 2019, i.e. MBBS batch admitted in first year. Batches admitted and studying currently in MBBS shall continue with existing Curriculum. One of the unique features of the syllabus its that it will include a new course called Attitude, Ethics and Communication (AETCOM) for students across years of their undergraduate medical education.It will also offer elective subjects allowing students to pick according to their respective interests. According to the apex medical regulator, competency-based Medical Education provides an effective outcome-based strategy where various domains of teaching including teaching-learning methods and assessment form the framework of competencies. Keeping this objective as the core ingredient, the Medical Council of India with the help of a panel of experts drawn from across the country laid the basic framework for the revised undergraduate medical curriculum. The document points out that over the past four years, a group of highly committed medical professionals working as Members of the MCI Reconciliation Board developed this information into a document incorporating appropriate teaching-learning strategies, tools and techniques of teaching, and modes of assessment which have culminated in the current competency based undergraduate curriculum. Make a basic degree like b.sc biology,biotechnology compulsory before joining MBBS.they attain some maturity and the time can be shortened and from first yr.they can have integrated teaching and more basic clinical oriented training.students are literally vexed with the present intermediate grilling studies. YOU WANT CHANGE MBBS CIRCULUM…. Make it cumulative, with equal weightage. include new topics such as epi – genetics, energy healing, holistic medicine etc, MBBS students know only whatever they read in texts, there are so many things happend in the world related to human health. Doctors do not know anything other than pharmacology and pathophysiology to treat patients there are many other aspects to treat a patient. Attitude, ethics, communication ,all non sence,which cannot be practiced unless the government provides free medical education.When people invested ,they expect returns.First the government should take over all private medical colleges provide free medical education and implement what ever it is. Government should also stop giving Diplomas and give Masters degrees in post graduation,Doctors who have been given Diplomas should be graded as masters after 5 yrs of practise.